Born in Christchurch, Jay Clarkson was a founder member of The Playthings (1980-82), who recorded for Toy Love bassist Paul Kean’s label Playmusic. 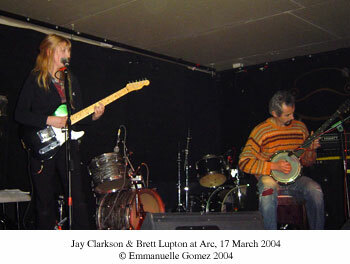 In 1983 Clarkson formed They Were Expendable (later shortened to The Expendables), and they showcased her songwriting. 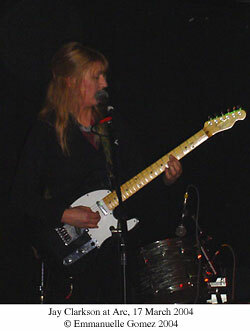 Her next band, Breathing Cage, won the Rheineck Rock Award in 1989 and, as part of the prize, recorded the critically acclaimed Misericord album. In 1993 Flying Nun released Packet, a compilation of songs from Clarkson's solo work and earlier Expendables releases. Her most recent release is Kindle (Arclife, 1999), which Chris Knox [Real Groove] described as "simply, SIMPLY gorgeous! Nine songs of unassuming, casual beauty." In March 2001 Clarkson appeared at Arc with poets Nick Ascroft, Claire Beynon, Diane Brown, David Eggleton, Emma Neale, Jenny Powell-Chalmers, Richard Reeve and Brian Turner as part of the United Nations Dialogue Among Civilizations programme. Her composition 4 Pieces for Classical Guitar was performed by Nathan Tane during the Dunedin Fringe Festival 2002. Now the words would be returned…. Was she a secret that couldn’t be told? The Flower/Man With No Desire 7"
How has your first musical memory influenced you? My first musical memory is bound to be that of my parents and their relatives and friends singing the popular songs of their day (both contemporary songs and those from their childhood). A room full of people drinking beer or gin, singing away, Grandpop playing honky-tonk style on the piano sometimes. Later on, when we moved from Wellington to Timaru, guitars and ukeleles became part of it all. My father’s sister lived in Waimate and we regularly beetled down there in our little bomb of a car. Two brothers, "Uncle" Ron and "Uncle" Ray, usually turned up with their guitars. One a big acoustic, the other a beautiful semi-acoustic (a Hoffner, I think). He’d plugged this into a little amp, something like a Concord. They usually warmed things up with Guitar Boogie, Uncle Ron (or was it Ray?) having already, earlier in the day, played Old Shep for us kids. I always sat at his feet, crying when he got to the last verses, where Old Shep dies. He was a good old dog. What got you started writing songs? My mother would talk to me about the structure of a song. Still does. She had no formal training - save her parent’s family and friends singalongs - but could appreciate a refrain or harmony etc which was, in her opinion, unusual or skilled. She has a great singing voice too. So again it was with music that there was enthusiasm, which for my mother regarding life in general was not so much the case. Dad also was always chirping away on some song or other. When the whole Mersey Scene hit various songs were focused on quite intensely in our household, the radio turned up when certain ones came on. Sometimes we’d be told to shut-up and listen, and then the song would be talked about; other times we’d all be singing along. As more of those bands began writing and recording their own material songwriting became, to me, coupled to singing. At twelve I asked for a guitar for Xmas and got one - quite amazing really because we were not well-off, to put it mildly. I began to take note then of other singer/songwriters, those not exactly in the fab or neat scene but with their own brand of cool nevertheless, such as Roger Millar, Marty Robbins, the Big O (my mother’s all-time fav). Men dominated the radio music world so I certainly sat up when informed Bobbie Gentry had penned her own, beautifully sung, hit, Ode to Billy Joe. Over the years how has your approach to songwriting developed? I still write quickly (furtively? - I have to be alone in the house). The lyrical content is less angst overall these days. Possibly the main reason I have been writing less is that I no longer feel very comfortable writing lyrics. In ‘98 I circumnavigated this by, for several songs, randomly choosing phrases from a favourite book or story. By placing these in an order pleasing to me I saw I had simply found another way of expressing a spiritual theme which has been reoccurring in my work for years! (Or does one reach a point where everything is imbued with spirituality?) This way I was able to complete my album Kindle. Discovering a phrase on guitar is the most common way I begin a song these days. It used to be as likely for a line of lyrics to kick things off but this is no longer the case. I used to relish memorizing a set of new lyrics and would go over and over a song whilst walking (which I do a lot of as I don’t drive). It’s a rare song now though which becomes imprinted on my memory banks. Recording helps, of course, because you tend to hear a track many many times. I have performed seldom the last two years. The few recent compositions I have completed continue to be a mixture of somewhat complex songs and more simple ones. The Man With No Desire; Memory Lane; Crying; Wheeling. There are one or two as yet unrecorded songs I keep returning to: Tangled Up & Bleeding (which is actually close to ten years old and the lyrics don’t match my head anymore but it’s a good song); Walking Boots; $2.00 Candles. Hopefully I will get them down this year, along with a few of their affectionate cousins. How does a song develop through writing, rehearsing, performance and recording? More often than not the song is all done when I come out of whatever room I’ve been writing it in. It is complete, that is, I could perform it solo and it would be utterly recognizable for what it is. On rare occasions during band rehearsal - if it is a song just out of the oven and during a period of my life where I am working with a band in an on-going capacity - some part of the song ( I’m talking structure/skeleton) may be altered during, say, the first or second go at it. The arrangement is a different matter. That’s what happens with the band and I’ve always just let people do what they want (unless I think something is really going against the song’s feel). I’ve worked with some great musicians. I need to work with musicians who know how to listen when I play them a song I’ve just written. My stuff isn’t the sort of music you join in by the third bar and jam. Sometimes I wish I did that type of music, but I just don’t tick that way. Recording-wise, any enhancing or embellishments are on the spot, made up then and there. That’s part of the fun of recording. The sound-engineer and/or producer can have quite an effect on the arrangement outcome. An impatient disinterested person at the desk or computer as opposed to an open-minded operator there to interpret your ideas, well, it can mean a whole different feel.